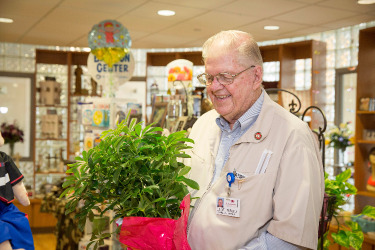 The St. Tammany Hospital Gift Shop is operated by the St Tammany Hospital Guild. Profits from the gift shop are donated to the St. Tammany Hospital Foundation and fund new equipment for the hospital in addition to employee scholarships to help advance our quality care. There is a range of gifts for all ages, including live plants, balloons for all occasions, wedding and baby gifts, and items for any occasion. The gift shop also offers seasonal gifts during holidays, in addition to personal hygiene items and snacks. The gift shop accepts cash, checks and credit cards.